Irfan produced the most econimical four-over spell by a bowler in T20s but King's fifty completed a successful chase. Mohammad Irfan produced outstanding figures for 4-3-1-2 but his effort was outdone by Brandon King’s maiden CPL half-century that guided St. Kitts to a six-wicket win over Barbados Tridents. The Patriots chased down Tridents’ target of 148 with King’s 49-ball 60 leading the way, even as Irfan threatened to derail it with his record-breaking bowling spell. 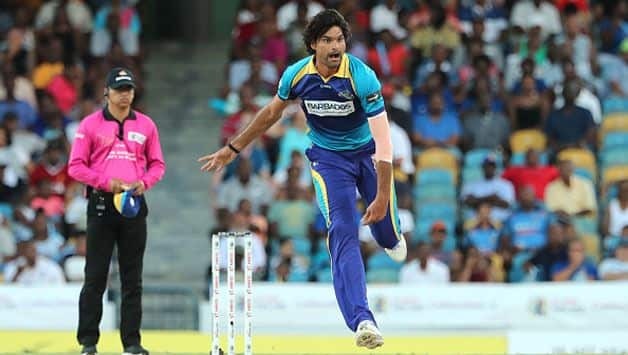 Irfan now possesses the record for the most economical figures by a bowler bowling four overs in T20 cricket, overtaking Sri Lankan Chanaka Welegedara and South Africa’s Chris Morris. The only run that he conceded came off the final delivery of his spell, which King took a single off. 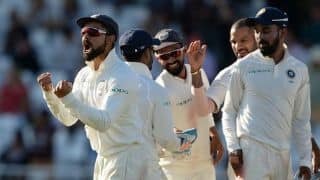 Irfan was on fire from the word go, removing the destructive Chris Gayle off the first ball of the innings before snapping up Evin Lewis two overs later, and it wasn’t until Irfan had finished his spell that St Kitts gave their innings a chance. Steve SmithThe first 42 balls of the innings yielded just 18 runs. However, once the other bowlers started operating, the next 30 brought 75. It was then that King shifted gears. He tonked Steve Smith, coming off figures of 2/19, for 27 in his second over and followed it with another 22 off Raymon Reifer. King’s half-century took time – it came off 42 balls, but he did the sensible thing of not giving away his start. King was ably supported by Devon Thomas and the two stitched a partnership of 88 runs for the fourth wicket. The stand was broken by Wahab Riaz, who also dished out economical figures of 1/17 from 3.5 overs. But as long as King was there, the chase was in control. The required rate that started off below 7.5 sailed past 10 with Irfan operating. The shackles broke after his spell was seen off and from there it was easy picking for the Patriots. King’s knock came to an end with Patriots still 27 shy of target. Ben Cutting then scored an unbeaten 29 off 21 to bring the Patriots their third win in five matches. They are now positioned second on the table with 6 points from five matches, only next to Jamaica Tallawahs. Tridents however slipped to the second-last spot with four wins from four games. For them, the bulk of the scoring was done by Jason Holder, who scored 54 off 35. The start looked promising with openers Dwayne Smith and Martin Guptill putting 39 before both set batsmen failed to convert their starts. Shai Hope chipped in with a 24-ball of 26 but their scoring rate was always kept in check by the Patriots bowlers. Australian allrounder Cutting and New Zealand’s Anton Devcich picked up two wicket each while not giving much away. Sheldon Cottrell went wicketless but together the three put tightened the screws on the Tridents. Brief scores: Barbados Tridents 147/6 in 20 overs (Jason Holder 54; Ben Cutting 2-18) lost to St Kitts and Nevis Patriots 148/4 in 18.5 overs (Brandon King 60; Mohammad Irfan 2-1) by six wickets.